There’s a T-Rex gobbling sausages, a Stegosaurus spilling beans! A Diplodocus in the frozen peas fills the aisles with greens! 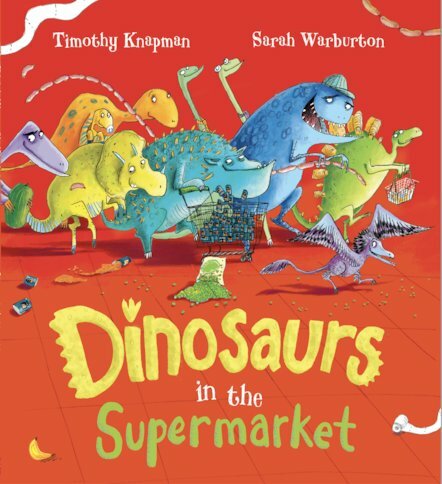 A little boy’s trip to the supermarket is turned upside down when a band of dinosaurs wreak havoc in the aisles. The prehistoric clan are causing truly historic chaos! Who will mop up this monstrous mess? Can a small boy get the big beasts to behave? This anarchic picture book shows that mixing supermarkets and ‘saurs is bound to end in a messy disaster. Shopping has never been so shocking! 510L Lexiles are the global standard in reading assessment. They are unique as they are able to measure a child and a book on the same scale – ensuring the right book gets to the right child at the right time.